Visiting our supported hospitals here, and meeting patients together with the doctors, is truly eye-opening. In hospitals at home, one can be fairly certain that those in need of urgent medical care are given a chance at survival thanks to the availability of all the medical equipment needed for life-saving treatment. This is a luxury, although it should be a universal commodity. 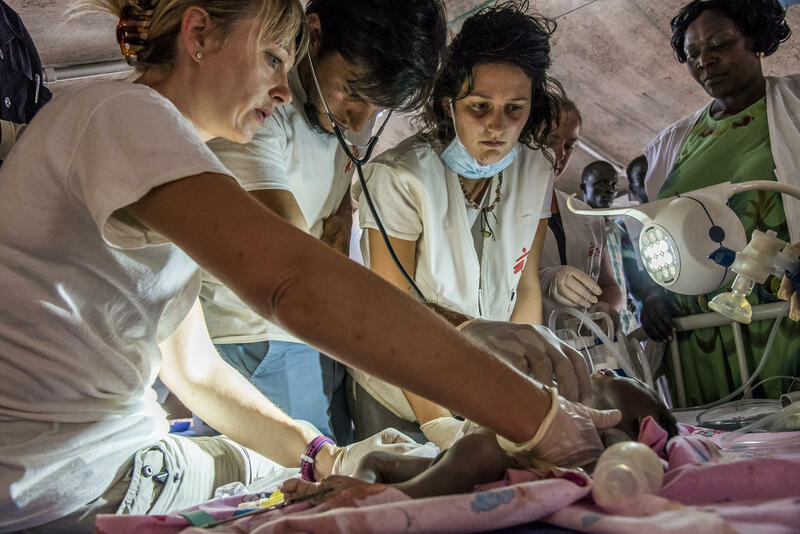 The two main types of patients you see here are people with gunshot wounds and newborn children with malnutrition. Both are sights that you would rarely, if ever, come across in hospitals at home. One of the most challenging days I had was when I visited the emergency room of our supported hospital. I was sitting in a quiet room where a local doctor was teaching me how to read heart monitoring curves. Suddenly, he was called to come into the emergency room. A local man had found a newborn baby, just a couple of hours old, in his garden, abandoned. I’ve heard gruesome stories of what people have had to see and endure. To give up their dreams, lose family members, be deprived of their youth and live in constant fear when hearing planes in the sky. The next moment I saw a team of doctors trying to resuscitate this tiny little bundle. So many thoughts ran through my mind. It was not only about seeing a newborn fight for life, watching her vital signs decrease in front of me, but also wondering what the mother had to go through. As strange as it is, the first feeling is sometimes anger more than sadness. People should not have to live somewhere where basic services do not exist. A newborn child should not have to fight for life in their first few hours. The same day, I met a woman who had brought in her nine-year-old daughter to the hospital. The daughter was a beautiful young girl. She seemed a bit disoriented, with tears running down her cheeks. The mother explained that she was collecting wood to make a fire and accidentally dropped the logs on the girl’s head. My local translator explained to me that there is a shortage of fuel. Things like gas have become very expensive due to the conflict. Many locals can no longer afford the cost and instead turn to using open fires in the house for cooking and heating. As a humanitarian aid worker, you become integrated into the country, as well as with the people, where you work. Your colleagues are not just your co-workers, they are your close friends who sometimes even feel like family members. The country where you stay, although for a relatively short time, becomes your home. To hear stories from people and see the effects of war, including a collapsed healthcare system, is one of the most challenging parts. Yet each day these same people come to work with a smile on their face asking me how they can help. It never stops to astonish me how people with so little are some of the most generous you meet. The Yemeni culture is incredibly rich, and the people are some of the friendliest. Someone once expressed that the country is like honey and bullets; in both metaphorical and literal terms. The honey produced in this country is some of the best in the world; it is like the sweetness of its people. Yet there is the aspect of war and violence. Everywhere you go, men are walking around armed. Some might say I have spent time in a place where I am less free; I cannot walk outside and I have to cover myself when I leave the compound. For me, however, I have yet again come to learn the incredible level of resilience we humans possess. If anything, it has made me realise what is truly important in life. Iraq: "A call came through that a suicide vest had been detonated..."